District of Columbia leaders and residents are celebrating a holiday that's unique to the nation's capital. D.C. Emancipation Day commemorates the date in 1862 when President Abraham Lincoln freed all slaves in the city. Lincoln signed the Emancipation Proclamation nine months later. District schools and government offices are closed on Wednesday. Planned activities include a parade and a concert. 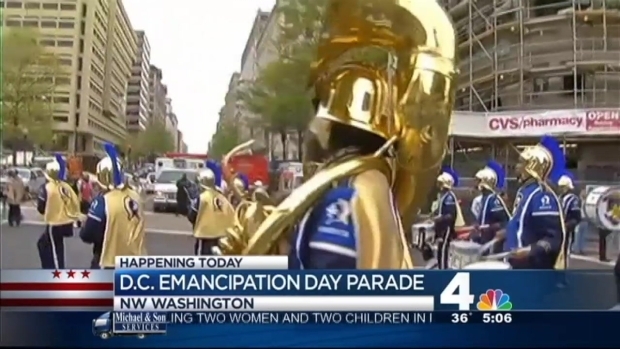 The parade and concert were the subject of a dispute between the D.C. Council and Mayor Vincent Gray. The council has a $350,000 budget for the festivities, but Councilmember Vincent Orange asked the mayor's office to cover overtime costs for police and firefighters on top of that. The mayor's office agreed, but only on the condition that the council relinquish control of Emancipation Day activities in the future. District of Columbia leaders and residents are preparing to celebrate a holiday that's unique to the nation's capital. Pennsylvania Avenue and surrounding streets will be closed between 3rd and 14th streets NW from 10 a.m. until 3 p.m.
Constitution Avenue and surrounding streets will be closed between 9th Street and the west crossover at Pennsylvania Avenue NW from 8 a.m. until 3 p.m.
Pennsylvania Avenue and surrounding streets will be closed between 12th and 14th Streets NW from 4 a.m. until 11 p.m.
E Street will be closed between 13th and 14th streets NW from 4 a.m. until 11 p.m.
12th Street will also be closed between E Street and Constitution Avenue NW from 8:30 pm until 9:45 p.m.